Tropical Coast (トロピカルコースト Toropikaru Kōsuto) is the third world of Sonic Lost World, themed after a tropical island and the sea. After Dr. Eggman loses control of the Deadly Six, Sonic and co. are chased here, and the heroes must make an alliance with their arch-nemesis to stop the Zeti. In the 3DS version, the player can gather Blue Material here. The first zone of Tropical Coast is set in a large place, similar to previous areas such as Windy Hill. The location is a beach area with palm trees and Badniks taking the land. Water overflows into fountains that Sonic can use to jump to a higher path. 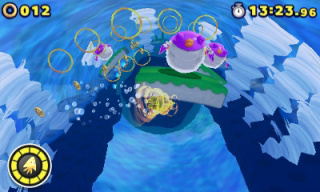 By using the Yellow Drill in this Zone, the player will dive to the other side of the tube and travel underwater for a while. This Zone ends with a bouncy cloud section full of extra lives that the player can grind over and over for. The second zone is also located in a tropical area, but this time there are large fruits that serve as the main obstacles and gimmicks of this Zone. These consist of giant apples and watermelons that will chase Sonic and hurt him if they make contact, and a giant pineapple that repels itself from Sonic. The goal is to bring these fruits to blenders to turn them into juice that forms bridges to other planetoids; if Sonic touches the blenders directly, it's instant death. The Orange Wisp also appears here, allowing Sonic to travel to other planetoids using Orange Rocket. At the end, the player fights Master Zik. Zone 3 is set in an underwater pipe where Sonic grinds across rails and avoid giant mechanical eels that suddenly appear throughout the stage. Minecarts are also seen on the rails in the stage as obstacles, which Sonic must jump over to avoid taking damage. Zone 4 is another stage set in the tropical areas, starting with 3D sections where the player must defeat Cluckers and Egg Pawns to get an Orange Wisp and proceed. The rest of the stage is a 2D obstacle course with platforms across water the player must jump across, ending in another struggle with Master Zik. 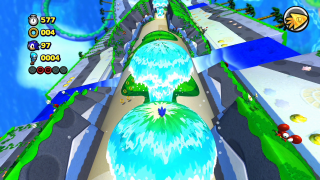 This secret Zone features Sonic flying through the sky similar to Sky Road Zone 3. By holding down the Homing Attack button, Sonic will curl into a ball and descend, while letting go makes him ascend. The player must avoid Badniks and buzzsaw-like flowers, eventually reaching a BFB that the player must descend to avoid. The first Zone of Tropical Coast is a 2.5D stage that is set up like a traditional water level in classic Sonic the Hedgehog titles. Most of the Zone is played underwater, with the player having to use the Yellow Drill Color Power to navigate mazes full of spike balls and twisters. Areas above water are filled with gimmicks such as rails to grind, geysers that catapult Sonic, and stepping stones with spiky undersides. The second Zone begins on a small island within a large tube in which Sonic must destroy Motobugs to unlock a large spring that will bring Sonic to another island. On this other island, Sonic has to roll apples to certain holes to make another spring appear that will take the player back to the small island where they must toll apples into the juicer to fill the tube with juice that will elevate the island. The player will eventually find the Ivory Wisp on the second island, allowing the use of Ivory Lightning. Zone 3 is a 3D stage that's also mostly underwater and revolves around heavy use of the Yellow Drill. Throughout most of the Zone, the player is roaming around in a 3D space to drill through twisters and defeat Badniks to collect more Yellow Wisp capsules. At specific points, the player is sucked inside a massive cyclone that they must navigate through with the Yellow Drill in order to escape; should the Yellow Drill run out in these sections, it's instant death. There is also a "Mach Speed" section halfway through the Zone that has Sonic running on a cylinder of water and grabbing rings using a Lightning Shield. Tropical Coast was also featured as a special event stage in Sonic Runners for a limited time with its own story. Team Sonic are on vacation at a beach resort when they find Dr. Eggman stealing the beach's many pearls to finance his bases. Upon setting off to stop him, they meet some Wisps who tell them that Eggman has kidnapped Mother Wisp while she was visiting her children. With Team Rose's aid, Team Sonic track down Eggman, but are too late to stop him from turning Mother Wisp into Nega-Mother Wisp. As one would expect, Nega-Mother Wisp proves too powerful for Eggman to control, but her Wisp children calm her down. Afterwards, Team Sonic and Team Rose continue to gather the pearls that Eggman stole. As an event stage, Tropical Coast was suitable for all three types of characters. This page was last edited on 2 March 2018, at 09:47.